Directions: From Denver head west on I-70 and exit at the Genesee Park exit. Turn left over I-70 and at the fork in the road turn left onto Genesee Mountain Road. As you make your way up the mountain, you’ll pass a picnic area with a large parking turnoff on your right. Park here. Genesee Park should be a wonderful hiking park. The park is huge, close to Denver, and beautiful. Unfortunately, Denver Mountain Parks have not been able to follow up on their Mater Plan and there are very few hiking trails in the park. 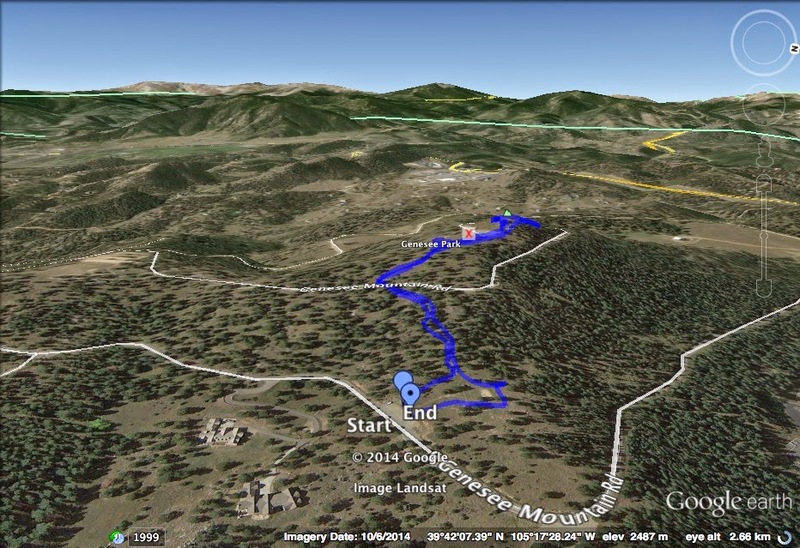 The main hiking trail is the Beaver Brook/Chavez trail. However, the Genesee Mountain trail is a nice, short hike to a picturesque summit, even if it is a summit that you can drive to. From the picnic area, look for a faint trail heading off to the left into the woods, once you find the trail is will become much more established. As you climb through the forest look off to the left for a good view of the futuristic house from the Woody Allen movie Sleeper. The trail crosses Genesee Mountain Road and continues up towards the summit. When you reach the parking lot, look to the north end of the lot for the trail. Once on the summit there are various rocky outcroppings that provide nice views back towards Mt. Evans and the Continental Divide. There is also a historic flag pole and memorial. Some short trails lead away from the flag pole to explore more of the small summit area. While not a long trail, the trail is a very pleasant hike through and area that will hopefully see more recreational development in the years to come.